Brynn Ebe, 8, stares down her opponent during the first Texas 42 tournament held in Weslaco. 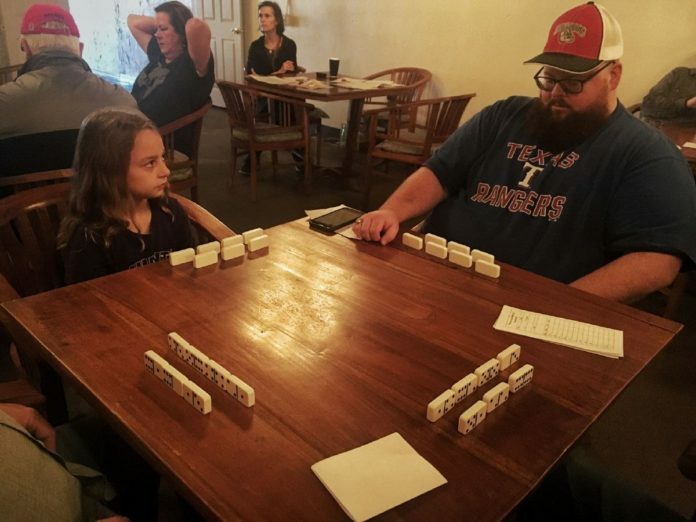 WESLACO —What began as familial bonding with his 5-year-old grandniece, birthed a local domino legend. Now 8, Brynn Ebe has made a name for herself in the world of Texas 42 — a four-player bidding game comparable to bridge. When her great-uncle traveled down for a visit and she wasn’t yet in school, Brynn sat down and learned to play. Their matches continued “every single day, like five times a day,” said the IDEA Weslaco student. According to her mother, Kristi Ebe, Brynn was a natural. The Texas 42 State Championship is held annually in Hallettsville. Last year, Brynn had the idea to enter. Her uncle spoke with the board to have them waive the age requirement of 18. So they entered as partners. Match after match, the underestimated twosome beat their opponents and advanced. Soon, the team led by the 7-year-old drew a crowd. Kristi, who considers herself more of a rookie, also entered the tournament and was knocked out rounds before. She stayed to support her daughter and uncle and said Brynn remained unfazed by the attention. “She was the star of the show,” Kristi said. By the end of the event, Brynn and her great-uncle placed 16 out of 187. When her favored partner is not in town, she said she doesn’t have the chance to play much. In order to stay busy, she involves herself in her school’s dance team and student council. Her favorite activity that keeps her mind sharp and allows her to keep up with her opponents — many of who boast decades of experience — is reading. Her hope is to attract more people to the game so they can begin having local tournaments. Kristi wanted to make that happen for her daughter so she began promoting a charity tournament. She spread the word by passing out flyers, posting on Facebook and visiting local retirement communities and nature centers. On Feb. 10, Weslaco Daily Grind, which Kristi bakes pastries for, hosted the Valley’s first-ever Texas 42 showdown. Eleven teams of two participated, some local, some from other Texas cities. Kristi and her partner finished sixth. Beth Gregory, the 2017 Texas State Tournament champion, partnered with Brynn for the event. Two-time state champion Leslie Houston, a technology strategist from Austin, was another player in attendance. “We’re here to have fun,” announced an instructor who stood in the center of the room explaining directions. The winning team got to choose from three preselected charities on where to donate the $20 registration fees. Brynn and her mother would like to see the Rio Grande Valley gain interest in Texas 42. They aim to host camps that teach others how to play. For more information, check out the Nation 42 Player’s Association on Facebook.